Let’s take a trip to Old Detroit. Fair warning: there may be a bit of myth-busting here, but as per usual, the truth is at least as interesting as any stories that may be tougher to prove. 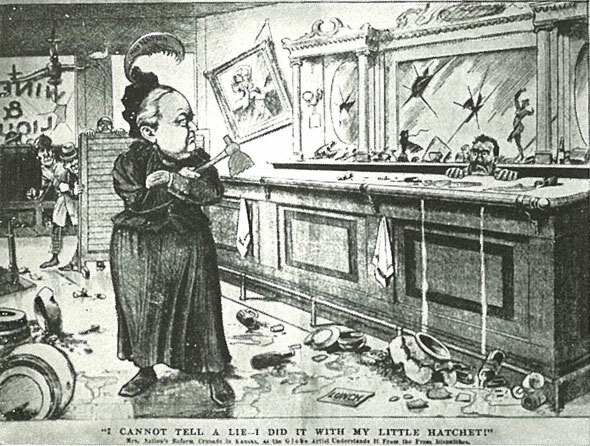 Carrie Nation, 1874. Can I get a crown like that please? You’re probably more familiar with the hatchet-faced and hatchet-wielding photos of Carrie (also Carry) Nation (1846-1911) from later years. Before she became the rabble-rouser we know now, though, Carrie suffered from two disastrous marriages: her first husband drank himself to death within a year of their marriage and her second marriage ended in bitter divorce. We don’t have time to go into Carrie’s entire sad story, so if you’re interested check out The History Chicks podcast and webnotes on her life and times. By the time she started bringing her show to Detroit, she was a well-oiled publicity machine all her own. With the rather begrudging support of the Women’s Christian Temperance Union, Carrie made occasional jaunts to Detroit and to Dry Oakland county. 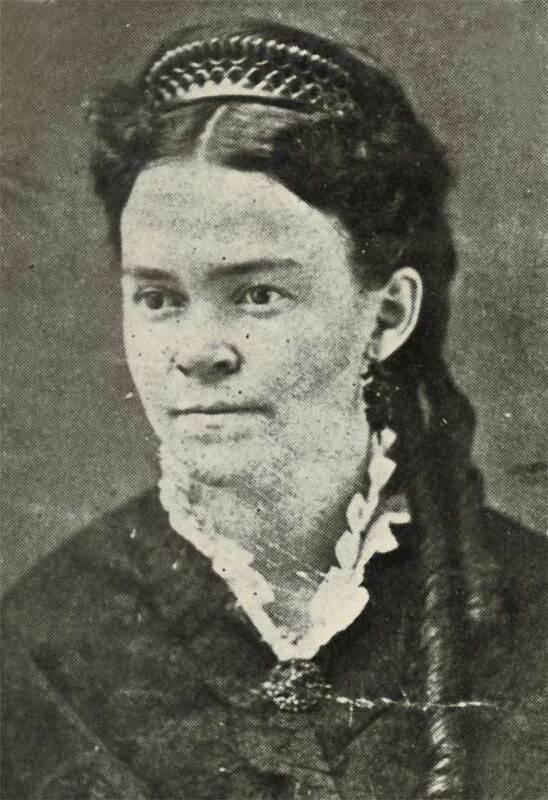 Her most infamous Michigan visit, at least in local lore, is her late August 1908 visit to Holly Hotel, in which she ostensibly busted up the place with her trademark hatchet, swept bottles off the bar with a massive umbrella, and generally caused enough mayhem to be arrested and jailed in Holly. Here’s where the actual history gets a bit hazy under generations of storytelling. Much as every old bar in Detroit loves to claim ties to the Purple Gang, the Holly Hotel loves its Carrie Nation stories. She was indeed in Holly on Saturday, August 29, 1908. In fact, she had a rather heated confrontation with Governor Fred Warner, who just so happened to be campaigning for re-election at the exact same time as Nation’s speech, between Baird’s Opera House and the Holly Hotel. The Holly Herald and the Detroit Free Press reported Nation flinging accusations of corruption against Warner for not cracking down on dry laws hard enough. “You’re a coward,” she reportedly screamed as Warner hopped back into his car and beat a hasty retreat. Whether or not Nation actually busted up the hotel’s saloon or was arrested, let alone jailed, remains a bit sketchy through. If she was arrested, though (and it is entirely possible that she was, I’m just saying I can’t find hard evidence in the brief search I did), she would paid her bail and fines through lecture fees and sale of her commemorative pins, like the one above. That’s marketing genius right there! She walked from the saloon into the back room, where the customers of the place are in the habit of eating beefsteaks and drinking beer around little tables, and she very carefully scrutinized the pictures that are hung upon the walls. Some of them are pictures of feminine beauty that are undeniably artistic, but not because of any superfluous drapery. “A gilded Hell,” exclaimed Carrie, as she returned to the bar-room and proceeded to deliver to the bartender a lecture on the evils of intemperance. Over this stay in metro Detroit, Carrie Nation held rallies of varying size in Royal Oak, Pontiac, Detroit and of course Holly. For the most part, the lectures were at the behest of WCTU members and suffragettes; Carrie Nation, among other strongly held beliefs, was of the opinion that temperance and suffrage went hand-in-hand. She also believed that the corset was an instrument of torture, designed by men to keep women so weak from lack of oxygen that their brains couldn’t function properly. Mrs. Nation has in her possession a hatchet sent her two years ago by Horatio S. Earle, with an exhortation to smash the fourteen hundred saloons doing business in Detroit at that time. The blades [sic] is still new, but tomorrow may tell a different story. …and then we hear nothing else, during the course of her stay in our fair city, about said hatchet(s). Although we may never know all of what transpired while Carrie Nation was in metro Detroit, the researcher in me has to speculate that subsequent use of the hatchet and arrest might have been newsworthy. I would be delighted if anyone could prove me wrong. Regardless of whether she actually committed property destruction while here, Carrie Nation’s visits to Detroit were always memorable. Her unique brand of fire-and-brimstone paired with the “stern grandmother” appearance were undoubtedly effective in stirring the pot for National Temperance, as well as for suffrage. And at the end of the day, we’re not wearing corsets and we can vote, so, you know, two out of three causes ain’t bad. Finally, to prove that the Freep of yore had a delicious sense of irony, immediately below the above-quoted article, was an advertisement for Budweiser beer, calling it “the most popular beer in the world” and reminding saloon-keepers that Budweiser profits were higher than those for any other beer.